Miss "K" is almost one years old! I can't believe it has been a year since we did her newborn session. She has grown into one cute little girl!! I had so much fun photographing her today. What a smiley, happy baby!! 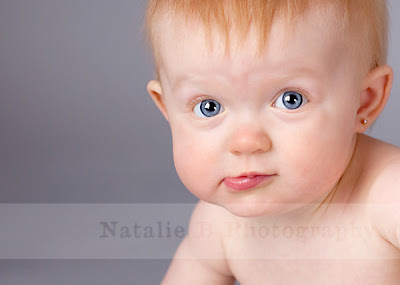 Miss "K" has the most beautiful blue eyes and strawberry blonde hair, the boys better watch out!!! I love this picture, she looks like she is thinking " Um seriously I have to sit in here naked and let you take my pictures? " We are going to try something new to get some more involvement on the blog so help out this client and post a comment! Once she gets 20 comments she gets a free set of wallets! That child has lots of personality! Love them as always! Absolutely adorable. I can't wait to see the rest. 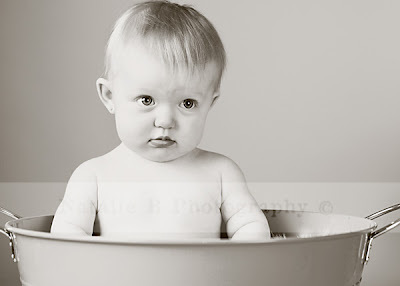 I hope to bring my daughter for her pictures soon. 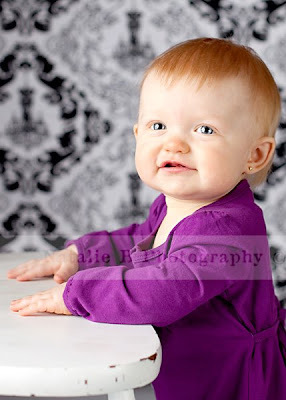 Little Miss K has lots of personality and sass...just like her favorite Aunt! Love these pictures. I will treasure these forever. Can't wait to see all of the pictures! She is so cute. Kennedy is getting so big and cutier every day. Can't wait to see the rest of them. You have a great photographer she has some good ideas and great shots. These pictures are precious! She is just soooo sweet! These are FANTASTIC Nat, you captured her in an amazing way! I would print that BW big big big! Oh WOW! These are just darling!!! What a little cutie! So sweet, and beautiful photography. She's adorable!